Students attend university for a multitude of reasons – perhaps for the social factor, or an opportunity to learn the skills necessary to join a competitive workforce. No matter the reason, students are keenly aware of the investment attending university provides, and employability matters more than ever. And for some students, enrolling at a university that has a reputable graduate employment rate will ensure a relatively easy transition once graduating into the world of employment. As a result, qualification and training providers, Theknowledgeacademy.com pulled data from QS Graduate Employability Rankings, to find out which universities in the UK are among the top 20 for graduate employment. The results represent the percentage of students who found a job within 12 months of graduating, and the data is for 2018*. The results place Lancaster University and the University of Aberdeen at the top of the graduate employment league table, both with 95.9% of students finding a job 12 months after graduating. University of Surrey ranks third with a substantial 95.5% of graduates securing a job after finishing uni. 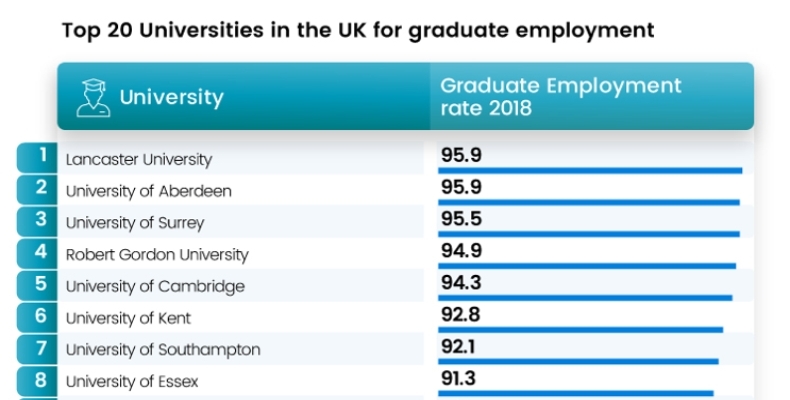 Intriguingly, the University of Cambridge (94.3%) is the fifth best university in the UK for graduate employment figures, whilst its rival, University of Oxford, was ninth. Although ranking ninth, figures for this renowned university illustrates an impressive 91.1% of students manage to source a job soon after finishing their studies. Towards the bottom end of the top 20 universities, sits the University of Hull, with a graduate employment rate of 75.3%. University of Birmingham and University of Warwickare came joint second from the bottom with 75.6% of graduates hired within 12 months. Moreover, five out of the nine Redbrick universities in the country feature in the top 20 universities for graduate employment: Birmingham, Leeds, Bristol, Nottingham and Newcastle.